Egypt, 1934. The Adventure Continues. Could there be something with the power to reveal what a person is really like, deep inside, an item whose mere possession would bring out hidden flaws or unsuspected strengths? It might also have other effects on anyone owning it—a potency to heal, or energize and enliven. Perhaps it could be transformative in even deeper ways. Would you want such a thing? Would you seek to keep it away from dangerous people? Such an item is the focus of this story, the official Volume 2 in the series, Walid and the Mysteries of Phi. There are mysteries in our world, along with paradoxes and enigmas. In this book, you’ll encounter many. Egypt has long been a land of mysteries. And the epicenter of those mysteries may be the area in and around Giza, where the Sphinx and the Great Pyramids are to be found. Legend has it that, long ago, something remarkable was discovered deep in the sand at the feet of the Sphinx, that great stone beast with a lion’s body and the head of a human. And this unique item may have within it the power to show what any of us really is, deep down. In this book, Walid Shabeezar, the young Prince of Egypt, will face new challenges in his efforts to find his proper place in the world. The story that results will take us deeper into an exploration of what lies behind our ordinary lives and hidden beneath the surface events of our world. It may upend your assumptions, or confirm some of your unspoken suspicions about what’s really going on in this life—whether in Egypt, or anywhere else. The short book, The Oasis Within, followed a group of men and animals from a small village in west Egypt as they crossed the vast desert headed for Cairo in the summer of 1934. It served as a prologue to the great adventure that was about to begin. The Golden Palace, Volume 1 in the subsequent series, Walid and the Mysteries of Phi, then saw these characters to their destination and the unexpected challenges that awaited them in the ancient city. Now, we can see what comes next. 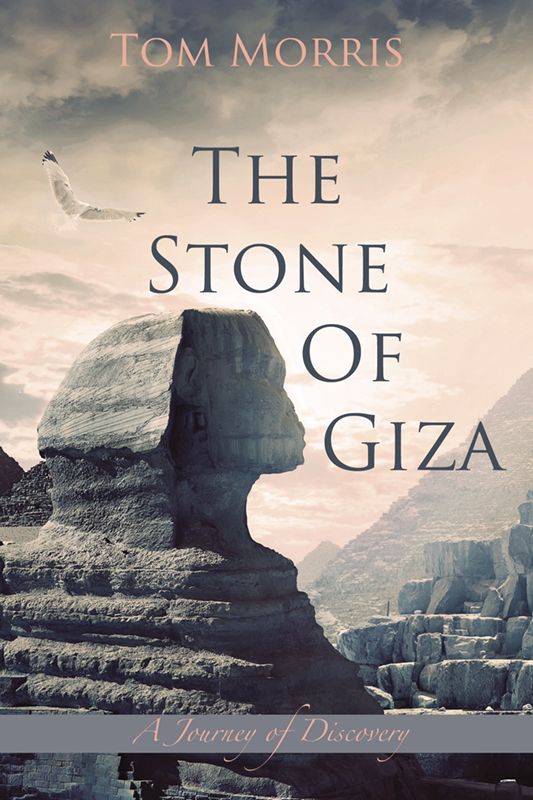 To purchase the Stone of Giza on Amazon, click here. Something of great surprise is going on behind this door. It was 1934, to be exact. And a vital lesson was about to be learned. Friendship is a risk. It can pay great rewards. But, there’s no way to chart its trajectory in advance. It’s almost uniquely powerful in the way it opens up a vast range of possibilities for good or bad. Where a friendship goes, and how it develops, is determined ultimately by the character and the actions of each of the friends. The boy’s hands brought surprising strength to his victim’s neck as he forcefully grabbed it from behind, gripping his throat hard and digging the nails of his fingers into the soft flesh. Walid felt the sudden, tight hold with a jab of sharp pain and a rush of blood to his head. He could barely think inside that swirl of sensation and knew he had to move quickly. He lunged backwards, seeking to find Mafulla’s feet with his own. They were nowhere near a wall or a solid vertical object, so there was no chance of a breath-expelling body slam to break out of the grip. But a hard stomp to the top of a foot could gain his release in an instant. Mafulla, however, had anticipated that and his feet were too wide apart to be reached. Walid’s hands then missed in the attempt to side-punch backwards, and since he knew he could grow dizzy and even lose consciousness in mere seconds, he did the one remaining thing he knew how to do. He bent his knees deep and pushed or jumped upward as much as he could in order to be able to come crashing down to the floor, legs limp. It was a risky move, but he knew that almost no one could maintain a neck hold using only his hands with arms extended, while the entire weight of the victim’s body suddenly fell down. The move worked and broke Mafulla’s firm, squeezing grip in a way that took him by surprise. There was no time for a further reaction from either of them as the large man standing nearby, the one who had barked the order, moved quickly toward the fallen boy. For a fleeting moment, only labored breathing could be heard. Then, Walid spun around and jumped to his feet into a crouching position, facing Mafulla, hands raised, while he still sucked in air. “Yeah, I’m Ok. Thanks.” Walid rose up into a normal standing position, relaxed, and looked over at Masoon. “But it was rougher than I thought.” Then he rubbed his neck and turned to Mafulla. “Goat cheese.” Mafulla’s eyebrows bounced twice in punctuation of his answer, as he massaged his arms. “What?” Walid was half confused, half amused. “Well, not today, I’m afraid,” Masoon interjected. “Why not?” Walid was totally surprised and disappointed. Walid said, “I sure feel stronger, and I can tell that guy is, too.” He pointed over toward his best friend, and then bent his neck back and forth to the side, left and right. “It was quite an experience,” Walid replied. “For me, too,” Mafulla said. The boys had regained their normal breath by now and, like usual, were beginning their end-of-session stretches while they listened intently, as Masoon continued to speak to them. “I hadn’t thought of it that way,” Walid said. “That’s pretty interesting.” Mafulla looked impressed. “This is really interesting,” Mafulla said. “This is all pretty wild,” Mafulla commented. Masoon was quiet for a moment. The boys had been hanging on his words, taking it all in. It occurred to Walid that this was a lot like his favorite conversations with his uncle Ali, and also like when Masoon once explained to him in the desert The Triple Double strategy for dealing with trouble. His thoughts drifted for a second to several flashbacks from the desert crossing that brought them to Cairo, but then he heard Masoon speak again. Mafulla stepped around to face Masoon, who reached out as he said he would. The boy exploded into a fast move he had been taught, while yelling loudly at his assailant, who instantly released the hold. Mafulla’s mouth fell open. “Really? Really?! !” He did a quick fist pump toward the ground and then another. “All Right! Yes! … Oh! I mean, I’m so sorry!” He was clearly shocked, thrilled, flustered, and pinched by a small twinge of guilt, all at once. The look on Mafulla’s face was indescribable. Walid was just laughing and really enjoying the sight of his friend lifted so high and brought so low, back to earth, in the course of about three seconds. “Great, great turnaround,” he said.